The abstracts for this year's Lunar and Planetary Science Conference are now online. LPSC is one of the largest planetary science conferences of the year, along with DPS in the fall and AGU in May and December. This year's Io presentations will be a diverse bunch with mission concepts, geologic mapping, and plume modeling, and statistical analyses of Ionian landforms. 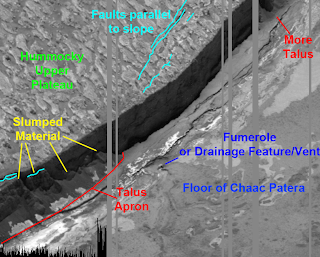 The first LPSC abstract I want to discuss here is titled "Paterae on Io: Insights from Slope Stability Analysis" by Laszlo Keszthelyi, Windy Jaeger, and Chris Okubo. Keszthelyi will present this paper as a poster on Thursday, March 4 at the Satellites and Their Planets session. In this presentation, the authors uses the slopes of Io's volcano-tectonic depressions, also known as paterae, to probe the properties of the upper 2-3 kilometers of Io's lithosphere. A nice example imaged by Galileo is Tupan Patera, shown at left. Keszthelyi et al. use slope stability analysis to constrain the potential composition of the upper part of the lithosphere by using observed slopes on Ionian paterae, which is related to the strength of that material. While Io's lithosphere is dominated by cooled lava flows that have stacked one on top of another, the upper few kilometers are thought to be a mix of sulfur and sulfur dioxide ices intermixed and layered with layers of basalt. These ices are volatilized by shallow magma chambers and magma conduits and mixed with ascending magma below those first few kilometers. Generally though, the upper 2-3 kilometers, according to Jaeger and Davies 2006, would be dominated by sulfur and sulfur dioxide ices. This process leads to a density gradient in Io's lithosphere, with the least dense material near the surface with density increasing with depth (just how much it increases depends on the resurfacing rate). Keszthelyi et al. tested three possible compositions: basaltic rock, solid sulfur, and unwelded ash (as would be expected from a pyroclastic deposit). The slope they tested in the program Slide was the 2.8-kilometer margin of Chaac Patera shown at right. The right part of the cliff in this image has a slope of 70° based on measurements of the shadow at the cliff base. Their slope stability analysis tested whether the above compositions can support this kind of steep slope. They determined that the slope could not be supported by unconsolidated material, like unwelded ash, as these would collapse to the angle of repose (like the talus apron you see at the cliff base on the bottom left part of this image). Such a steep cliff would be okay for cold sulfur or basalt. The authors note that without more detailed slope profiles (see, we need the laser altimeter and radar instrument on JEO), they can not distinguish between the two compositions. In general, based on the abstract's Figure 2, slopes composed of cold sulfur would have more concave profiles (steeper at the top than at the bottom) than those composed of basalt. One additional point that Keszthelyi et al. makes is that these slopes (regardless of composition) could not withstand Ioquakes greater than a moment magnitude of 4. For comparison, last week's earthquake in Haiti had a moment magnitude of 7. This goes against intuition a bit when you see the height of Io's mountains and how quickly these structures are built, not to mention Io's intense volcanic activity, which could cause tremors as well. The authors note that this contradiction would be resolved if the stress on Io's faults is relieved by daily tidal flexing, rather than in massive earthquakes, as they are on Earth. They also point out that Windy Jaeger's work on tectonics in Io's lithosphere in 2003 suggested that the "globally-averaged stress level in the crust is close to the sliding friction of the faults." Put together, stress on Io's faults, rather than building up slowly over time until released on a sudden jolt, are relieved on a regular basis in much smaller events, small enough that they are not a major factor in the degradation of Ionian paterae wall slopes. I want to return for a second to that image of the margin of Chaac Patera. I have re-posted it here, this time with annotations. 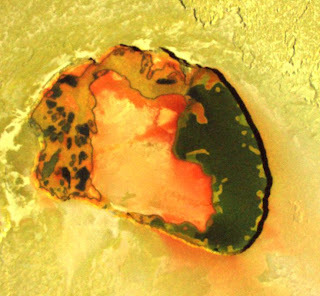 I am definitely going to do another post on this thing, maybe later today, because it really is just freaking awesome to finally understand what is going on here (hint, I am now a firm believer of sulfur volcanism on Io...). Anyways, let's stick to analysis specific to our discussion here, the stability of the Chaac Patera margin. Now, the 70°-slope section can be seen on the right side, with very little loose material at the bottom of the slope. In fact the patera floor at the bottom of that slope looks like asphalt pavement (not saying it is, just that it looks that smooth at this scale, ~7 meters per pixel). On the bottom left and the far upper right ends, we see a change in slope, the result of talus — loose debris at the base of the cliff at about the angle of repose (we'll leave the two-tone talus discussion for tomorrow). So what makes these sections different from the more stable middle? 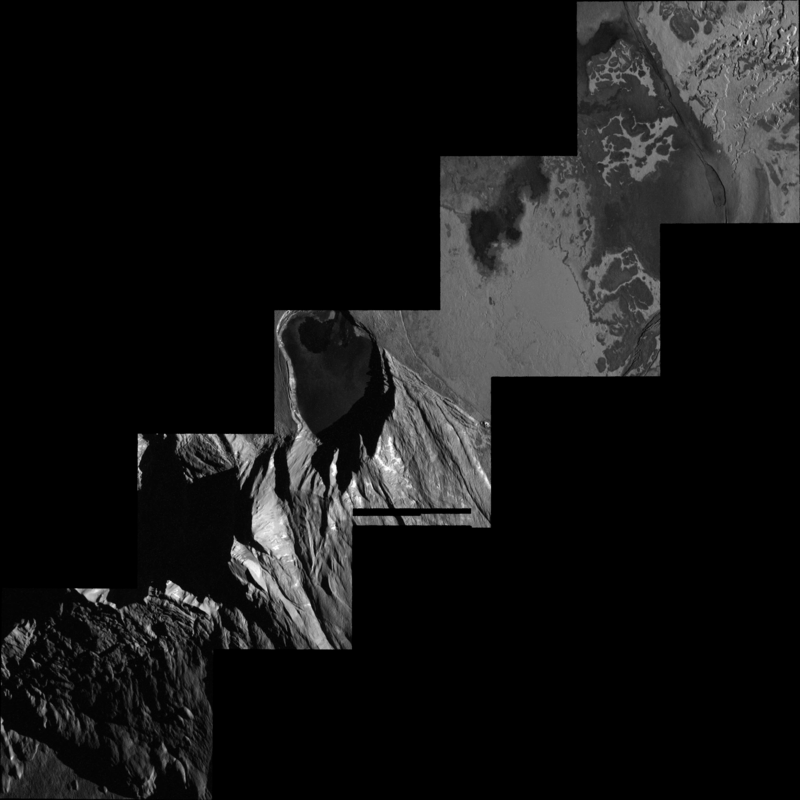 It is a little more difficult to tell in the upper right corner because of the data dropouts and the edge of the frame, but to the lower left we see section of the wall that have broken away from the upper plateau and slumped down hill. The likely cause of this slumping seems to be local faults that run parallel to the margin of the patera, best seen at the top of the image. These suggest that Chaac Patera is continuing to expand due to continued collapsing along the patera margin. We see examples of this kind of faulting at other Ionian Patera, such as Gish Bar Patera and Radegast Patera. Regardless, while it would seem that some patera wall slopes eventually succumb to slope failure (note the terracing along some sections of the margin of Radegast Patera), many observed paterae slopes show no sign of mass wasting like talus aprons or terracing and thus require strong material like cold sulfur ice and/or basalt to hold up these steep slopes. Keszthelyi et al. will present an interesting paper on the geology of Ionian volcanoes in March at LPSC. Definitely check it out if you are going to that conference.